I could post my international speeds on my BigPipe VDSL line, and they would look good (very good actually! ), but if I did that, it wouldn't really be a fair comparison as we don't have many customers yet vying for that giant pool of bandwidth as you guys would rightly point out. But I will tell you that we are definitely aiming for this to be an ISP the techies (like you guys) want to choose, which means catering for people who are high users, so we want to make that experience as good as possible - hence the name 'BigPipe'. Basically we will be taking all the money that ISPs normally spend on things like free email, antivirus, tv bundles, etc etc, avoiding that cost, and ploughing that money into delivering a nice fat pipe for you to use as you want. We have no plans to shape traffic or have a fair use policy at this point, and we believe that is sustainable, but obviously I cannot promise we will never do that. I mean, if we end up getting people doing really stupid stuff like trying to run their own ISP from home on a BigPipe, then we may need to do something to stop the network getting hammered to ensure everyone elses gets a good experience. But....if you want to torrent loads of Linux ISOs or access streaming content that is totally fine as far as I am concerned, and certainly for the trial we want people to do lots of that stuff to give us a thorough try out. 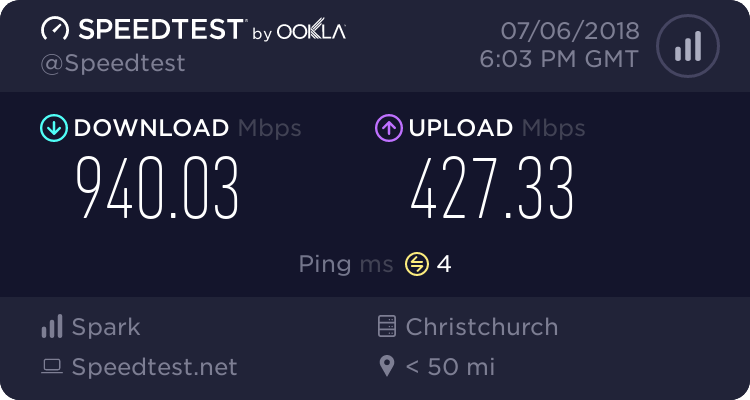 I'm certainly doing my best to try us out streaming heaps of stuff at the moment probably getting up to around 200GB/month or so. So Telecom boots us off Go Large on to Big Time, then axes Big Time to eventually make a new ISP which offers almost the same thing......... why ? EDIT: This caused us to go to Slingshot due to no immediate unlimited replacement offering from Telecom at the time. Not to mention CEO stated earlier this year that datacaps are here to stay due to being a good source of revenue. Bit of a roundabout isn't it? Being a sub brand of Telecom like Skinny is not a bad thing, I would say geeks here will be more likely to give you a try as opposed to a fresh no name ISP with no backing. We've seen plenty of those fail over the years. Yup. Looking forward to getting some of you guys on board. Well I've signed up to be considered for the trial and I'm sure at least a few others here have also done so. I have to say I like your style of communication and open and honest approach. It's not really for me personally, I am happy with my current provider, but welcome to the market. Interested to know how you are handling the throttling of connections to 1Mbit. I have seen some terrible implementations that make 1Mbps connections behave like dial up because the connection ramps up, hits the limits and then gets slapped down. networkn: I have to say I like your style of communication and open and honest approach. It's not really for me personally, I am happy with my current provider, but welcome to the market. An un-metered $99 VDSL plan will undoubtedly attract the usual bunch of cohorts who download content 24x7. How are you going to preserve general web browsing, gaming, voip/skype performance? Yep. This is one of the reasons we are doing the trial, to make sure we have it nailed before selling it to thousands of people. As of right now though, there is no shaping etc, and no plans to implement it. Heh I knew that, but I'm saying ain't you going through Telecom's standard BNG or actually running this through a completely separate network from Telecom's? Like, does the IP range come from Telecom or is it on a testing subnet?